If there’s one thing about Dokidoki! 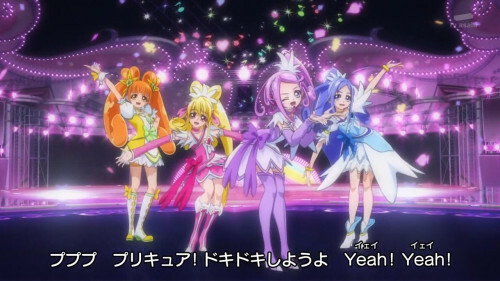 Precure that really stands out, it’s the characters. You might be thinking, “But isn’t that true for just about every other Precure you’ve reviewed?” It’s certainly true that the characters tend to be a substantial part of Precure, and with its “enemy transforms people’s selfish desires into monsters whom the heroines must fight with the power of magic sparkles and martial arts action” premise Dokidoki! Precure is pretty typical for the franchise. However, with respect to its heroines, Dokidoki! 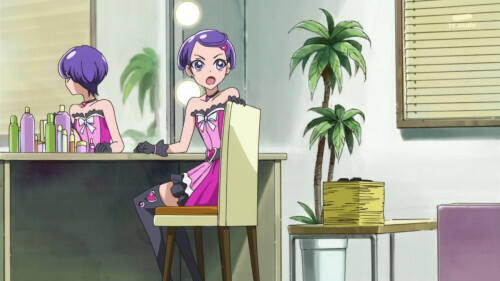 Precure differentiates itself from its predecessors in that it really pushes the concept of its main cast as role models and targets of wish fulfillment. The girls of Dokidoki! 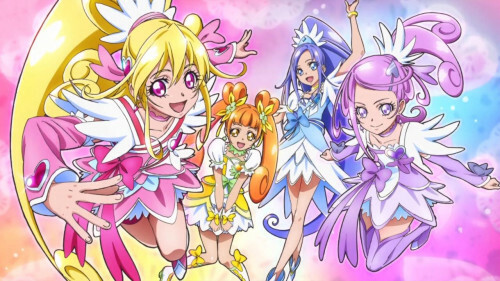 Precure are larger than life even before they transform into magical girls. Take Hishikawa Rikka, Cure Diamond. She’s a level-headed student council vice president, the best friend of main character Aida Mana, and the top student at their school. Her dream is to become a doctor, and the fact that she’s already studying medicine in middle school is pretty amazing. In terms of ambition and power, she’s already at a level higher than most previous Precure characters, who are usually just the ace of their athletic teams or club heads or whatever. She’s also in a way the least impressive of the Dokidoki girls. Mana, Cure Heart, is student council president. She also gets high grades (though not as high as Rikka), and is sought after by all of the sports clubs because of her all-around amazing athletic skills. On top of that, Mana is relentlessly energetic yet cool under pressure, able to handle the work of ten people without breaking a sweat. Mana is perhaps the most effective leader in Precure history, and yet even she’s no match for Yotsuba Alice (aka Cure Rosetta), who is the kind-hearted heiress of a powerful business conglomerate, well-versed in a variety of martial arts, and is basically what you’d get if Daidouji Tomoyo mega-evolved into Batman (complete with badass butler). And even that arguably pales in comparison to Cure Sword, the last surviving warrior of a kingdom destroyed by evil and greed, who has escaped to the human world in the guise of Kenzaki Makoto, pop idol sensation, while bearing the burden of having to restore her fallen homeland. All of the central characters in Dokidoki! Precure are outstanding beings, and the degree to which the anime is able to live up to that standard is essentially what dictates the strengths and weaknesses of the series. Dokidoki! 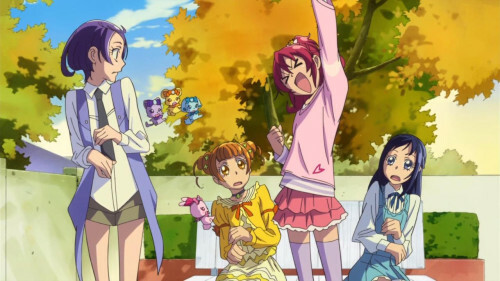 Precure follows a pretty typical children’s anime pacing, where there’s a lot of episodic content and then a swell of story during the end of each approximately 13-episode chunk, and although there are plenty of episodes which explore the characters’ impressive qualities, there’s a sense that they could have done more. Alice is the biggest example of this, as every episode about her ends up being amazing but are also few and far between. Similarly, I thought Makoto’s reverse-identity (her real name is Cure Sword) wasn’t portrayed with as much consistency as the concept could have handled. Also I really wished they kept using the awesome bows from the middle of the series, perhaps the most impressive Precure toys ever in terms of giving young viewers the chance to wield things that look like actual weapons. …Maybe that’s why they went away. I’ve seen some people be critical of Mana, saying that she overshadows the other characters, but I never found this to be the case. The issue isn’t that Dokidoki! Precure devotes too much to Mana, or that Mana is somehow too perfect to be a protagonist, but that many episodes are designed to be formulaic and self-contained to a fault. If you look at the episodes which are devoted to the greater narrative, they do an excellent job of pushing things forward, and by the end the story wraps up nicely with a conclusion unprecedented in Precure. While I enjoyed watching every week, Dokidoki! Precure ends up being one of those shows which benefits from having a list of “important episodes,” especially because the show concludes very well in spite of some large plodding spaces in the middle of its run. At the same time, if you’re comfortable with kids’ show pacing, it’s not much of an issue. Dokidoki! Precure is reliable as an introduction to the franchise as a whole, while its different take on characterization can be refreshing for those already familiar with Precure. PS: The first ending of Dokidoki! 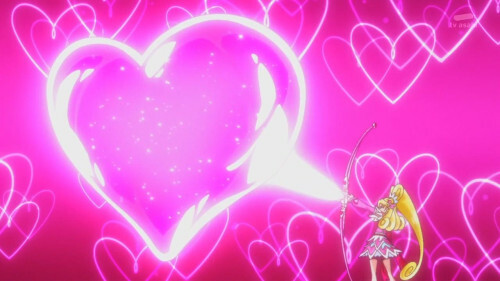 Precure is actually now my favorite Precure ED ever. Maybe it’ll be yours too. This entry was posted in anime, mahou shoujo, review and tagged aida mana, dokidoki precure, hishikawa rikka, kenzaki makoto, madoka aguri, precure, pretty cure, yotsuba alice. Bookmark the permalink. You seem to have left one out! And I see why you did and agree, Ace always felt weird and out of place, thematically. Ace is okay, though not without her flaws. I was just trying to keep the spoilers to a fair minimum (not that I think mentioning that a fifth Cure appears is too big a spoiler). I know your trying to be a good guy but I have to agree with the Anonymous guy, Cure Ace is sort of a big deal. If people thought that Mana overshadowed the cast then they never could have dreamed of Cure Diva. That girl hijacked the plots of other characters in the middle of their own episode.